Thanks to an undersized but athlete true freshman offensive lineman and a rather jovial 300-pound starting left offensive tackle, there are some comical scenes taking place during UConn football team meals. Ryan Van Demark, listed at 265 pounds, is a rare true freshman to get snaps at offensive tackle during UConn coach Randy Edsall's coaching career knows he needs to add weight to reach his potential. While much of that work will come through the team nutritionist and strength coaches, sophomore left tackle Matt Peart is trying to do his part. "Some of the older guys will help me out," said Van Demark, who split time at right tackle with senior Tommy Hopkins in Saturday's loss to Virginia. "Matt Peart will follow me around the dining hall and load me up with some more so they are all helping me try to gain that weight." 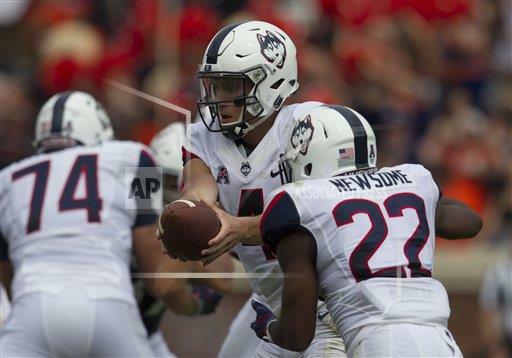 Van Demark is one of 10 true freshmen to see snaps in UConn's first two games of the season which tops the total from the previous two years combined. With all due respect to his classmates, getting playing time right out of high school as a running back, defensive back, linebacker or special teams performer isn't quite as rare as having that happen at offensive tackle. I asked Edsall how many times he played a true freshman at offensive tackle. "Not a 261-pound tackle," Edsall said. "He is a competitor, what you look at is do they have the confidence in themselves to handle that situation. If I can look into a kid's eyes and tell if he's got that competitiveness, that want to go out there, know that he is not going to back down." Edsall said the plan was the use Van Demark on every third series and to him credit, it wasn't immediately evident that he had replaced Hopkins in the Virginia game. He most noteworthy moment came when he went about 20 yards down the field to throw a block on a screen pass to Arkeel Newsome. "That whole game gave me some confidence," Van Demark said. However, rather than pat himself on the back for one of the most impressive blocks in the game, the first play he mentioned was one that didn't go quite as well. "One play I overstepped the guy and he came inside so you can't really do that but going against a different color jersey it helped," Van Demark said. Van Demark received some quality snaps in preseason camp, especially as the second-string left tackle. He was moved to right tackle so he had experience at both spots since he moved by senior Brendan Vechery, who has started 16 career games, as the third offensive tackle. "Right when camp ended they were like, 'you are on the two deep, congratulations.' It was exciting and (UConn offensive line) Coach (J.B.) Grimes really pushed me to where I am.
" I have to put on some weight, put on some muscle, I have to work on my footwork, I am still a little sloppy but everything will come with good coaching from Coach Grimes and Coach (Rhett) Lashlee." Van Demark is also getting plenty of help from Hopkins. to keep that spot and I am doing all I can to take it," Van Demark said. "He is helping me out and I am helping him out, it is a team." When Van Demark came into the game, he lined up alongside of 286-pound redshirt freshman Cam DeGeorge making the Huskies a little smaller than your typical right guard-right tackle combination at the FBS level. "Both of those guys are real smart and have athletic ability," Edsall said. "One play, you saw a play when we ran a screen to Arkeel twice on Saturday, Ryan was able to get on the guy and drive the guy down the field and in the first (attempt) we didn't block that guy. "Ryan has to get stronger, his hands have to get stronger, he is smart. They understand concepts, they do have enough athletic ability to get themselves in the right position, they might not be able to right now take somebody and blow them back off the ball because that is going to come with added strength and added weight but as far as understanding things and also sit there we (say), 'this kid is showing me that he can play then you look and he is a freshman and you say OK do we redshirt him. "You look at the overall body of work of what you have offensively and look down the road, you are looking at how we can make ourselves the best for this year and take a shot, say we are going to throw him in there, thrown him in against a team like Virginia that has some pretty good offensive linemen so he has earned himself a way to get more snaps and same with Cam. All they are going to do is continue to get better the more game reps they are going to get." Van Demark committed to UConn only a couple of weeks before Bob Diaco was fired which made for some anxious times. "The coaching change was pretty tough," Van Demark said. "When I heard that Edsall got rehired, I was pretty ecstatic coming from his rep and when I heard Coach Grimes was coming to UConn, that was like, 'OK, UConn is it, let's go.' Coach Edsall came down to the Hun School to meet me and once I met him I knew I wanted him to be my coach." UConn came out of the Virginia game in pretty good shape health wise. Starting safety Anthony Watkins is in concussion protocol and did not practice today. Freshman Ian Swenson, who played most of the Virginia game after Watkins was injured, is now listed as the starter. Edsall said that long snapper Nick Zecchino is back home in New Jersey dealing with a medical issue so Darien's Brian Keating is set to handle long snapping duties against East Carolina on Sunday.